To generate i3d files of your 3d-models you can use the exporter plugin for Autodesk Maya. The GIANTS Editor and the GIANTS Engine can only load i3d files. 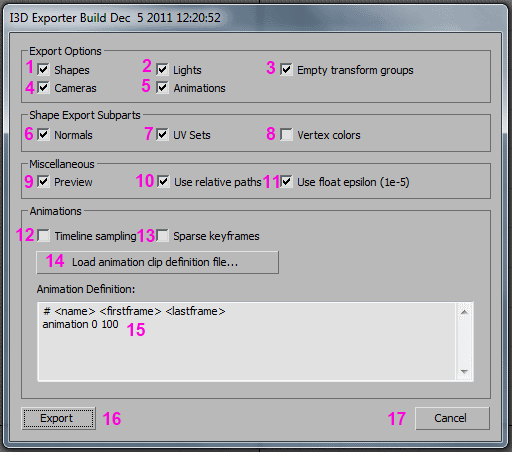 This section of the documentation will show you, how to export i3d files with the I3D exporter plugins in Autodesk Maya. The first thing you probably want to do is to install the exporter plugins in Autodesk Maya. Before you can actually use the exporter, it’s wise to check certain things with your 3d-model in Maya which can cause issues later in the editor or the engine. 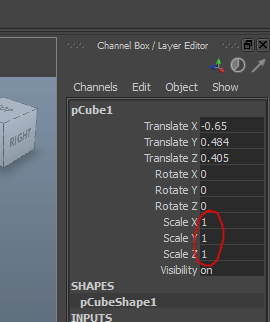 In the Channel-Box you see the transformations of your selected object. The ScaleX, ScaleY and ScaleZ of your object should be 1 1 1. If you just plan to use this object as a static mesh or with no physics at all you could export it with any scale you want, but if you want to simulate your object in the engine (as a dynamic or kinematic rigid body object) the scale must be 1 1 1 otherwise the physics simulation will produce incorrect results. If you have an object with scale, you can easily get rid of the scale. 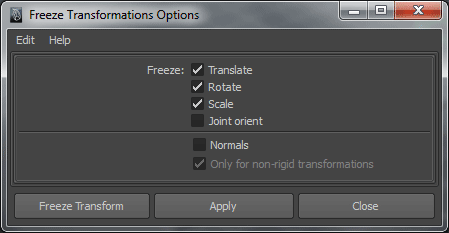 Go to the Modify-Panel, and select the option box right of the Freeze Transformations. The Freeze Transformations dialog window opens. You can select the checkbox scale and hit apply. Note: Please refer to the artwork guide for further information about asset conditioning for the engine. The export panel is quite self-explanatory. In the export options part you can include and exclude parts from exporting (IK, Animation, Shapes, Nurbs Curves, Lights, Cameras, Particle Systems and/or Default Cameras). The Shape Export Subparts section allows you to control which subshape attributes are exported (Normals, vertex Colors, Texture Coordinates and/or Skin Weights). In the attributes panel you can load and save attributes of your objects those attributes will be saved into the Maya file and are translated into the correct i3d attributes when you export to a i3d file. The first thing you have to do here is, that you must press the "Load Current" button at the bottom in order to load the attibutes of your object. Otherwise everything is unchecked and is not showing the attributes that are currently active on you object. So be sure, to hit this button first. Here you can see the name of your current working object. This section handles all the attributes regarding to physics rigid bodies. Here you can define your joint-attributes in detail. One thing you might miss here are the joint limits, they must be defined within Maya, since your object can have many joints with different limits. You can define the limit of a joint angle by the limit informations of your transform-object. Occlusion Culling, Objects that are entirely covered by other objects may be culled and thus not rendered at all. This option can increase the rendering performace in the engine if you have big objects containing much smaller objects, for instance a house. If you activate the occlusion culling on the root-node of the house all its childs are also not rendered, if the house is complete covered behind other objects. However, you should not apply this attribute on too many small objects because it is one more task for the engine. Non Renderable, With this option a objects will not be rendered at any time. Use this option for collision geometry. If you have complex objects with sub-objects attached, be careful with this checkbox since this attribute is also going to affect all the attached children. Clip Distance, This value defines how far the object is still going to be rendered. If you have a large scene and tons of objects this is a powerful method to keep your framerate high. After you have defined all your attributes, you have to hit the "Save Current" button to save your attributes. If you have lots of objects with the same attributes, you can select them all, and then use apply selected to apply the current settings to all the selected objects. Remove current resets the attributes to the default values and if you want do reset multiple objects, you can select them all and hit "Remove Selected"
With this panel you can validate if one of your objects have an incorrect pivot. In Maya your pivot can have a local and a world space attribute which you can find in the attribute editor on the right side. The x y and z values of both, local and world-space have to be 0 0 0 otherwise you will get a warning. You can fix incorrect pivots with the FreeezeToPivot option in the tools panel. If you have validated your objects and a local pivot was not set to 0 0 0, you can quickly fix affected objects with the FreeezeToPivot button. Custom Shader: Use the attribute name 'customShader' with a string type to add a custom shader to the material. The value specifies the path of the custom shader xml file relative to the maya file. Custom Shader Parameter: Use the attribute name 'customParameter_<parameterName>' with a string type to specify the value of a custom shader parameter. The values should be space separated. <parameterName> is the name of the parameter as specified in the custom shader. Custom Shader Texture:: Use the attribute 'customTexture_<textureName>' with a string type to specify the texture of a custom shader texture. The value specifies the path of the texture file relative to the maya file. <textureName> is the name of the texture as specified in the custom shader. Place the files I3DExportUI.mel and I3DExporter2014-x64.mll into the folder "C:/Documents and Settings/<USERNAME>/My Documents/maya/scripts". Start Maya and open the Script Editor window. Highlight the commands, then use the middle mouse button, to drag the highlighted MEL commands to the shelf. Maya don't like backslashes so replace them with slashes. Replace <USERNAME> with your username. 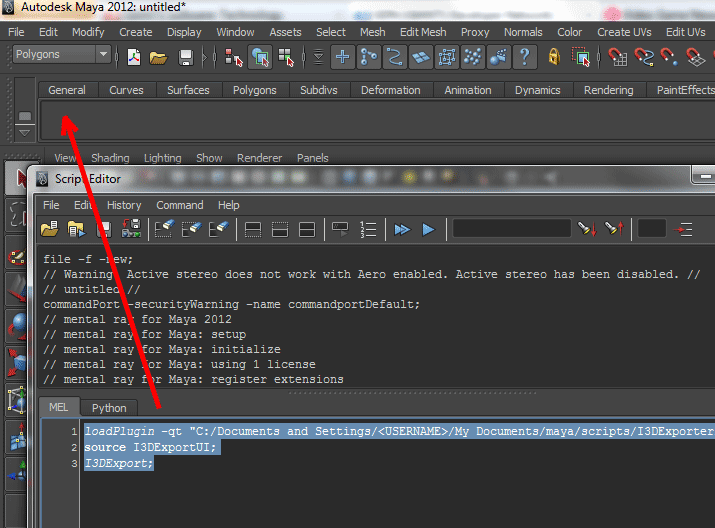 Copy the I3D_icon.bmp into the folder "C:/Documents and Settings/<USERNAME>/My Documents/maya/2014/prefs/icons". Edit shelf to replace the default icon with the one enclosed. Simply select "Export" from the file menu within 3DS max and select "GIANTS I3D (*.i3d)" as the file type. After selecting the output file, you'll be prompted with the export options dialog. Enables relative paths for texture references. If enabled, all texture paths are relative from the I3D target path. Of course, all textures should reside on the same drive or you'll get absolute paths anyways. Forces small values near zero to be rounded to zero. This animation definition will divide the 3ds MAX timeline into three clips named "walk", "jump" and "run" which can be accessed individually in the I3D. The I3D exporter will act unit-agnostic and react to the unit settings in your 3ds MAX scene file. If configured properly, the output file will always have the right scaling. The export plugin also exposes custom attributes to configure special I3D flags for nodes in the scenegraph. To change flags and options for a specific nodes, the I3D attributes have to be attached to the node. To do this, enable the "I3D Utilities" panel, which will present you with a big "Add I3D attributes" button. All you have to do then is to select a node and hit the button. There is a separate set of attributes for lights, as they have other options than the normal nodes. 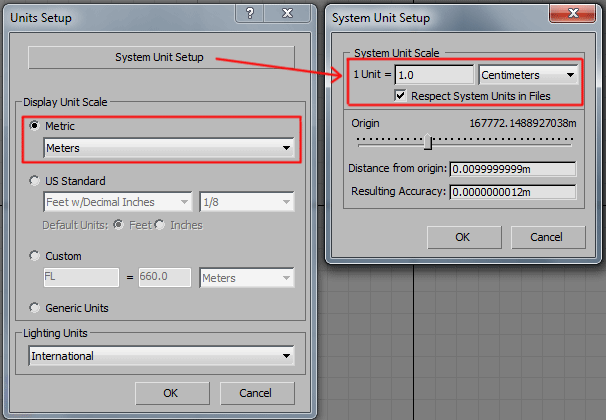 Here, all supported attributes of 3ds MAX nodes are depicted. Values from the I3D rollouts are always supported, values from the stock attributes are marked with a number and explained below. To find out more about the actual meaning of the attributes in the I3D please consider the I3D documentation. As 3ds MAX does not allow strict ordering of nodes on the same hierarchy level, the I3D exporter will sort the nodes by their names. Because it's not always wanted that nodes are named awkwardly, the I3D exporter allows for prefixes in the form "prefix.name" (.e.g "A.house", "B.house", "C.house", ...). The part before the dot and the dot itself will be removed from the node name in the exported I3D (so the examples will all be named "house" in the I3D file). That way, you can choose the export order by changing the prefix without being worried that you have to mangle the names in the I3D. To define LODs for a specific node, you'll have to attach the I3D attributes to it. The LOD view distances can be defined there. The actual geometry nodes must be directly parented under the LOD node and sorted descendent by their LOD level. So, if "LODHouse" is the node with the LOD attributes configured to have 1 additional LOD, you'll need "A.house" and "B.house" parented to the "LODHouse" node. A.house will become the first LOD and B.house the second LOD level. On a Windows 7 (english version) this would be the path C:\Program Files\Autodesk\3ds Max 2014\plugins for example. Launch Blender and go to "File -> User Preferences...". Click on "Install Addon..." in the "Addons" section. Select the file __init__.py and click "Install Addon...". 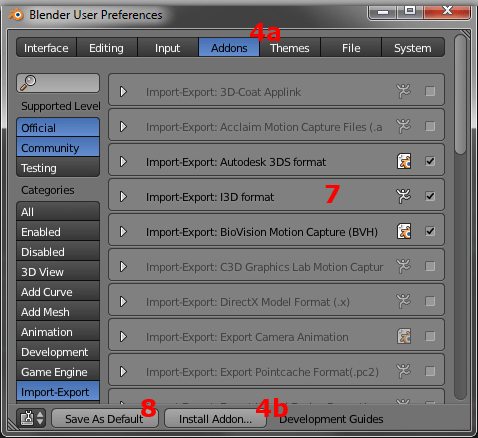 Select and enable the "Import-Export: I3D format" addon in the right list. Hint: Apply the "Community" and "Import-Export" filters on the left for less items to browse. Click on the "Save as Default" button to automatically load the addon each time you launch Blender. Now, you can export with "File -> Export" to "GIANTS (.i3d)". Autodesk 3ds MAX and Autodesk Maya are registered trademarks of the Autodesk Corp.